It was by far by best year of blogging. Reviewing everything I wrote and posted this year, I am filled with joy at the memories I created and captured. Blogging for me is a way to process and a way to remember. It’s also turning into a way for me to plan; more on that at the end. Blogging is about creating a web log of what you do, but to be successful (intentionally leaving this undefined) you need to do this with some sort of routine. That’s where I’ve always struggled, and that’s where I started my year 2013. I made a commitment based on this blog post from my friend Jon Swanson (who I get to see in-person this Friday!). I took his prompt and made it my own. I decided to create a Monday morning routine where outlined my “big rocks” for the week that needed to get done. I did it! Literally for 52 weeks I had this list going. Routines were a big part of 2013 for me. Routine was the theme, but here’s some other highlights from the last year. Katie and I got up to the Northwoods for a great ski outing. I finally launched Exercise is Medicine in Madison. That had been hanging in my mind for a long time and it has a long way to go, but it’s out there. I started triathlons! What an experience to learn how to (competitive) swim. My competitive juices got jacked with that training and I can’t wait to get after it more this summer. My parenting skills rose to the next level, and I wrote about the 5 things I learned taking the kids all weekend. Speaking of kids, we had our third! Hans Christian was born on May 17. 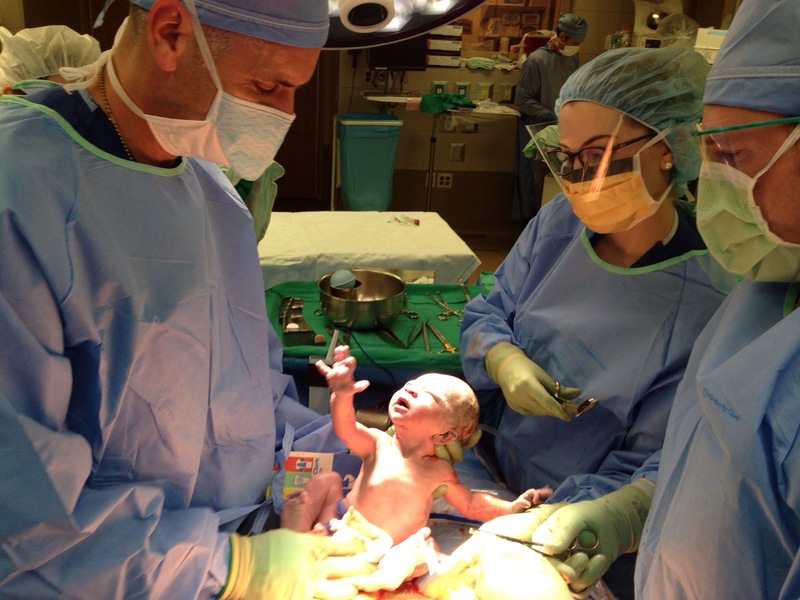 Katie went into labor six hours after I handed in my final research project for my masters degree. May was a crazy month. (Note: if you don’t get to go back and read all these links, at least check out some of the pics. Especially the Hans Christian post, my pic of the year). My most popular post of the year was about the Boston bombing. I’ve always been a good dad, but this year I was more aware of my role and I became much more intentional. Of course part of that was the whole man-to-man and zone defense transition, going from two to three children. But this Boston post really struck a nerve with people because we need intentionality and bravery from our dads, and we need that to overflow to our kids. Blogging was significantly improved this year because I got to be a beta tester for a great app called Pressgram. The idea is that so many issues of privacy and ownership arise with services like Facebook and Instagram. John Saddington created an app that lets me post pictures to my own blog (here!) so that I retain all rights to the pics, then I just put a link to Facebook and Twitter. Beta testing was fun to be on the inside and watch him build it from the ground up. We built a neat community and I met some cool guys. Again, it led me to be more intentional with my blogging, even if it was simply posting a pic and one line of text. I subsequently gave up Instagram and haven’t looked back. For a couple years I had been developing a relationship with the guys from Jars of Clay via Twitter. My spiritual journey is marked with many books, significant people and conversations, and albums of lyrics and melodies, none more prominent than Jars of Clay. To get to know them personally has been an honor and a blessing. They were in town for the Pulse conference at Blackhawk church and I got to have a couple beers with them as we started a nice in-person friendship. Sorin started his first organized sport and Norah began ballet. For parents with older kids, please excuse me. But this still blows my mind what the kids are doing. I’m just amazed at how old they’re getting. What a privilege to see Sorin have teammates and learn how to play soccer. What a joy to see Norah’s excitement to put on her ballet outfit and learn with her four classmates (the year-end video was adorable). And then there’s 4K. Sorin started school. What a kid. This is a year in review, so no time to elaborate. But I need to write more about this experience. The highlight for me thus far was begin there when he got off the bus after his first day of school. From my new relationship with Jars of Clay, I was able to do an interview with Charlie for their new album out in the fall. It was quite an experience to have your blog post retweeted by a band with 80,000 followers. And the album, Inland, has grown on me and become one of my favorites. It tells of a journey and I’ve connected with the character and the story in very meaningful ways. You should seriously consider the album! In the fall my job started to change significantly. I added some contract work where I’m developing a site for the Institute of Wisconsin’s Health. It lead me two write a couple times on work that matters and you should be able to feel a collective sigh of relief as I’ve transitioned careers into the next season of my work. Back in 2006 when I started blogging, I was most influenced by Mark Batterson. This fall, I was very affected my this video of his where he talks about the legacy of his words. It’s sparked a fire in me to finish the year strong and continually rethink why I write, why I publish, why I take pictures. Earlier in this post I wrote about how my blogging has affected not only how I process and remember, but how I plan. I have a better game plan for life because of my presence on this blog. My man-card got renewed this year. I went on my first hunting trip and was it a good one: pheasant hunting in South Dakota! I learned a few things there and I’m already in discussions with the powers that be (wife caring for three kids on her own) to get out there again next year. In December I got to spend one-on-one time with three of my favorite people. 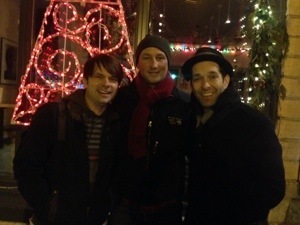 I had drinks with Charlie and Steve from Jars of Clay before their Christmas show in Waukesha. They did their sound check and met me at a little tavern to celebrate the release of their album and toast the end of the year. This Friday my favorite blogger Jon Swanson is driving through Madison with his wife. Katie and I will get a chance to have some coffee and dinner together with them. Both of these social outings are special to me because each of them have been so influential in my growth this year. And finally, I ended the year thinking about thinking differently. I loved the end of the year, especially the Apple commercial with the boy an his iPhone. But I also ended the year being willing to think differently about my workflow, my habits and routines. I grew a lot this year and I find it interesting that I ended the year not resting on my laurels but challenging the process. I look back and I see the key influencers in my life, namely Jon Swanson, Jars of Clay (especially Charlie and Steve), John Saddington (and Pressgram), and Mark Batterson. This entry was posted in blogging, Discipline, Grad School, Life, Twitter on December 31, 2013 by Hans Schiefelbein. beautiful. Happy New Year to you and your family, Hans. Blessed to have had our friendship grow in 2013. Right back at you, my friend! What a great run in grad school. So glad our friendship has continued. Happy New Year Lisa!